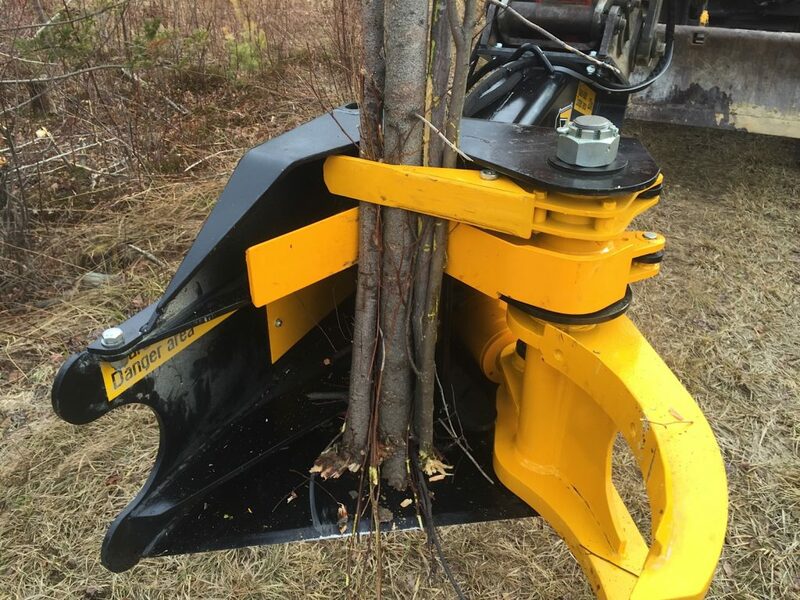 A game-changing excavator-mounted tree shear for forestry, roadside, and utility line cleanup. Before other shears have finished making their first cut, the TMK Tree Shear has moved on to the next tree. 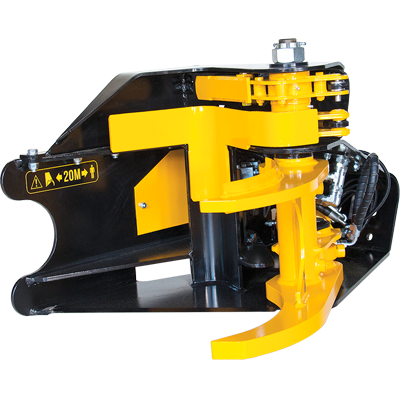 An effective cutting mechanism allows the TMK tree shear to employ a smaller cutting cylinder, allowing for faster cutting cycle time and a lighter tree shear. Small size and a precisely designed structure makes the shear good fit for tractor cranes, miniloaders and small excavators. This powerhouse, weighing only 165 kg, cuts 200 mm trees comfortably. One of the most versatile shears on the market. Easy operating makes the TMK 300 a great choice for small scale users, and with very high productivity it fits perfectly for the professionals in the industry. Developed to cut down Central Europes big trees, the TMK utilizes power produced by custom designed cylinders. Thanks to these cylinders we can cut up to 400mm trees. For excavators from 10 ton to 30 tons. 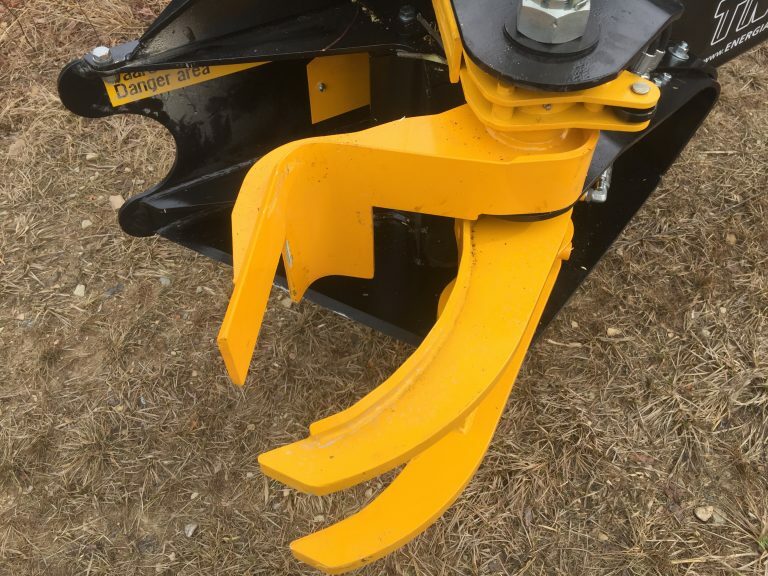 An excavator mounted shear can reach out, up, down, cut a tree or limb, bring it back, and place it for the next sequence of work, all without moving the work platform. Access trees on slopes, reach over fences, landscaped spaces or other obstacles that would prevent access. This approach is more time efficient, minimizes site impact, and reduces fuel consumption. 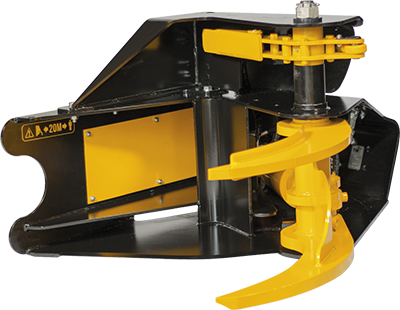 An effective cutting mechanism allows the TMK tree shear to employ a smaller cutting cylinder, allowing for faster cutting cycle time and a lighter tree shear. 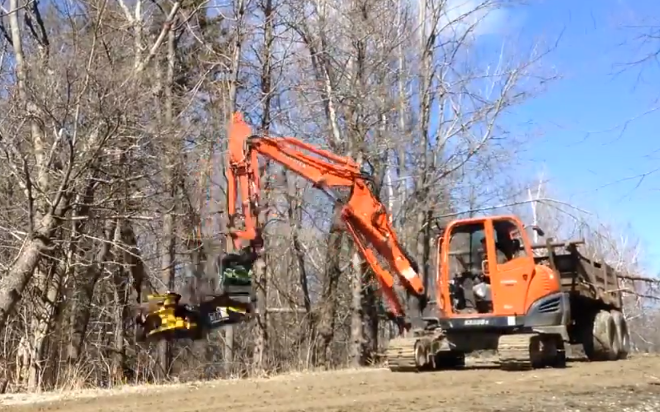 This improves tree cutting efficiency and makes it possible to use the TMK Tree Shear on smaller excavators. The key to this effective tool is a grapple that pulls the tree across a thin hardened blade. The angle of the blade allows the excavator to apply force to the cutting process. 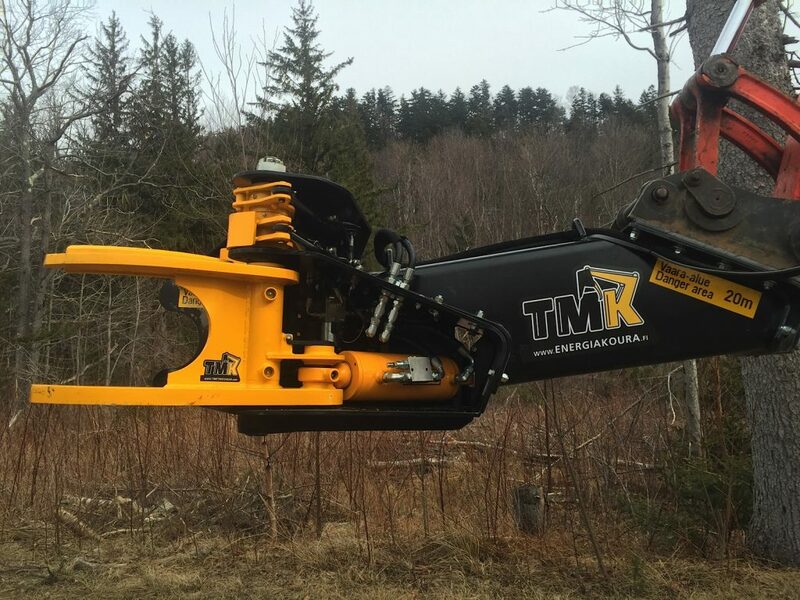 The TMK Tree Shear holds the cut limb or tree so the operator can safely place it in the desired location on the ground or in a vehicle. It can do this in two ways – the grapple or the collector can hold material. This is a major safety and time efficiency benefit other shears lack. For years Finland has been a world leader in the development of forestry equipment. Tenho Koponen, who designed this shear, has worked in Finland with excavators and tree shears for years. This proven and tested design is the result of many years of trial and error. Built entirely in Finland using Hardox 500 steel, the TMK Tree Shear is beautifully made. Using only 12mm thick steel for the cutting edge, the shear can quickly and easily cut through soft and hardwood. They can take the weight and force of a 20 ton machine, but can be employed effectively on a 5 ton machine. The TMK Tree Shear’s ability to grip and hold material offers safety benefits. 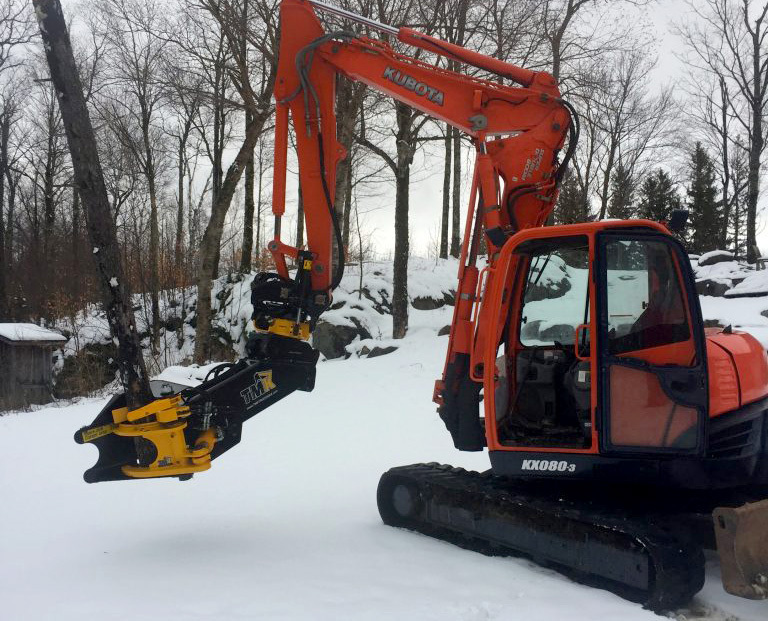 An excavator can reach up to a high limb and remove it safely, or has the option to cut a larger tree down in pieces instead of cutting the entire tree all at once, again offering a safer, lower impact approach than a skid steer or chain saw. 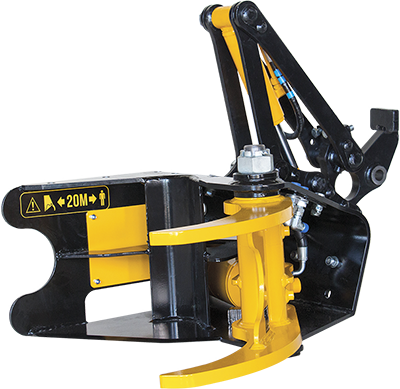 With the TMK Shear collector and grapple grip system, you can safely reach dangerous limbs, cut them, and safely bring them down to the ground. 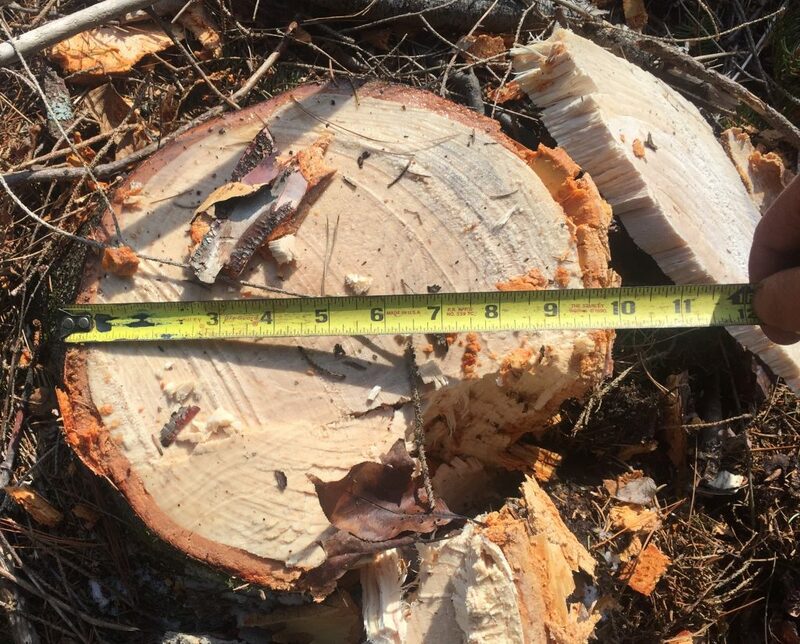 For larger trees, you can cut them down in pieces, reaching up and removing the top half safely. With the top half gone, you can more safely cut the bottom half with a chain saw. 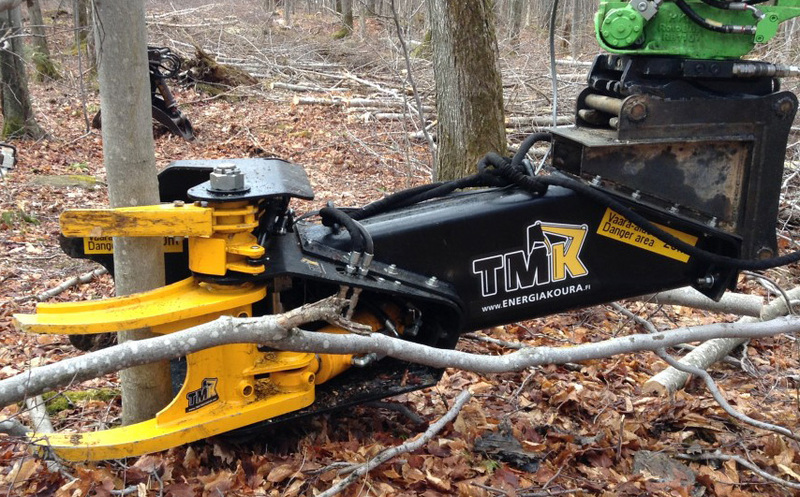 The TMK Tree Shear on an excavator offers a great tool for laying out a vegetation mat for logging access. With the shear you can collect all available material 20 to 30 feet from each side of the trail, cut, and lay it down. 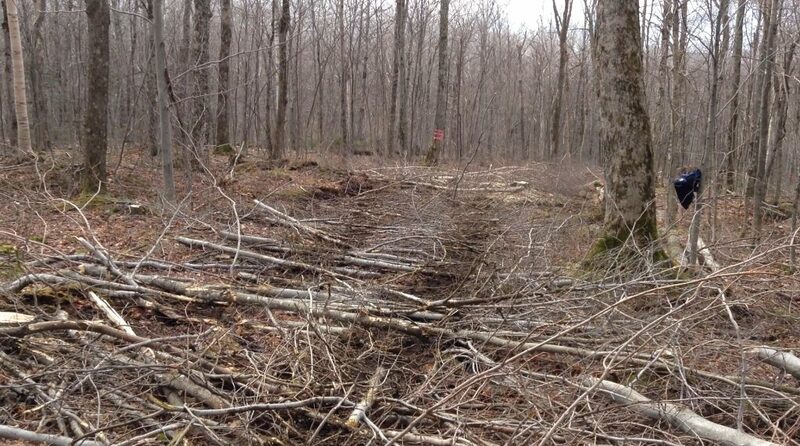 This system minimizes impact and can make logging in areas possible at times that would otherwise not be accessible. Has your TMK tree shear collector been releasing trees? Do I need a collector for my TMK tree shea?